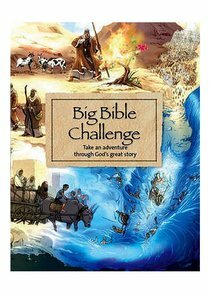 "Big Bible Challenge" presents 100 key Bible stories in an exciting, child friendly format. The stories are grouped into 20 Bible challenges, each featuring five Bible stories, one in full and four in summarised form with the opportunity for the reader to find out more. Each challenge helps the child to explore the Bible both visually and through responding to suggested questions and activities. The book is ideal for using as part of E100 challenge so that the whole church family can follow the programme together.